1. Head of Dental Department, Sarawak General Hospital, Kuching, Sarawak. 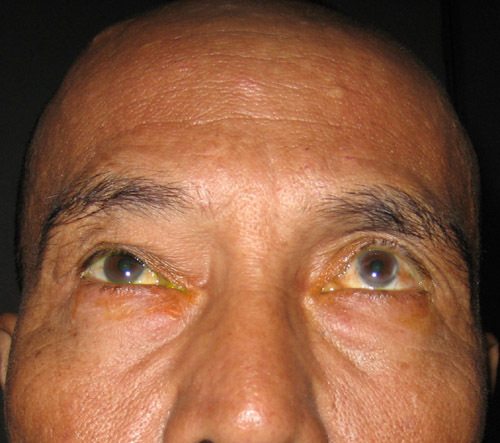 A 58 year-old man presented with a right progressive ptosis of two-year duration and a solid hard mass arising from the roof of the anterior orbit. He had no past medical history of note. He also suffered from diplopia on upgaze. His vision was 6/6 in both eyes and palpation confirmed the presence of the lesion extending from the medial half of the orbit to the medial wall. Ocular movement is full except on up-gaze. Figure 1 and 2. 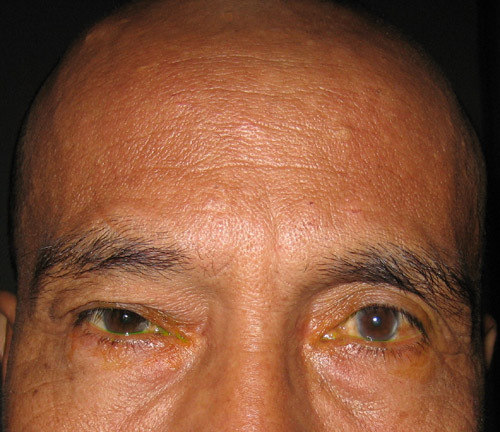 Right ptosis with fullness of the superior sulcus. Mild restriction of the right eye on upgaze. A CT scan of the orbit revealed the following features suggesting of frontal and ethmoidal osteoma. Surgery was planned for excision of the lesion. osteoma. The lesions are hyperdense as the bone. a. What is the nature of these lesions? b. How can the lesion be approached and state the advantages and disavantages of each approach?